This dish turned out real well, although the family didn’t appreciate it as much as I wanted them to. My Mom would cook “Lion Heads” on special occasions, so I always thought it’s a difficult dish to make, who knew this simple recipe captures the essence of this traditional Chinese dish so well! 1. Mix together the first seven ingredients and form into golf-ball sized balls. 2. Heat up some cooking oil in a large pot, place the meatballs into the pot, brown on all sides. 3. Add the 1 cup of chicken broth, the 1 tablespoon soy sauce and the 1 tablespoon rice wine and bring to a boil. 4. Cover, reduce the heat and simmer for 20 minutes. 5. Add the napa cabbage, cover, and simmer for 10 more minutes. 7. 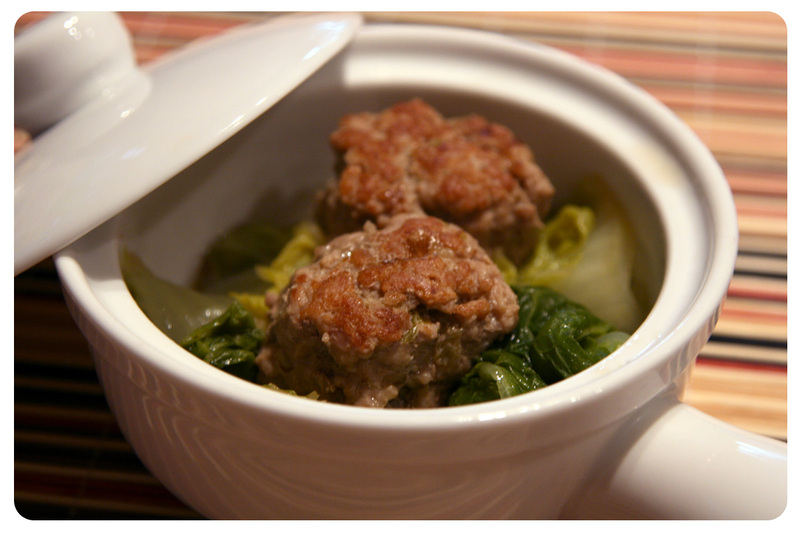 Remove the pork balls and cabbage from the liquid and arrange on a serving platter, pour the broth over. 8. Serve with white rice, enjoy! 2. Place the pork balls on a baking sheet and bake at 375°F for 25 minutes. 3. Place the pork balls in a large pot (Dutch oven) with the 1 cup of chicken broth, the 1 tablespoon soy sauce and the 1 tablespoon sherry and bring to a boil. 6. Dissolve the 1 tablespoon cornstarch in the 2 tablespoons cold water. 7. 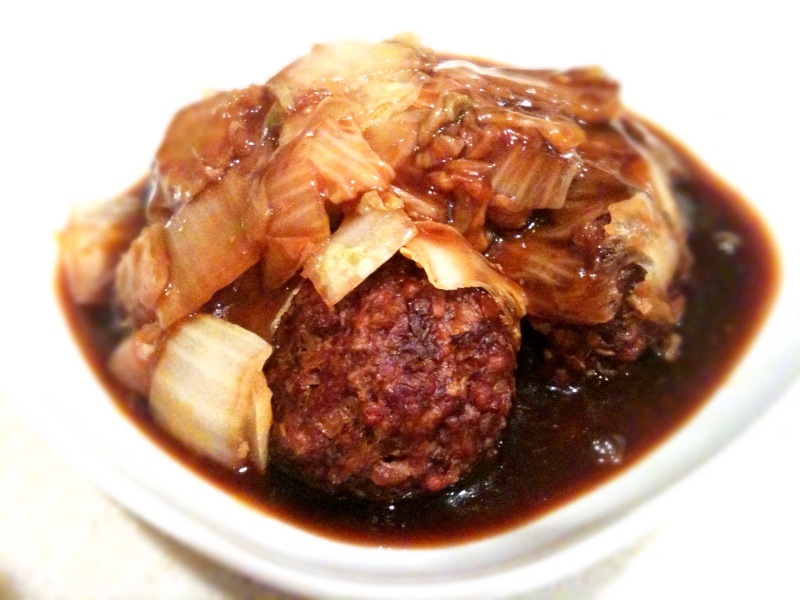 Remove the pork balls and cabbage from the liquid and arrange on a serving platter. 8. Stir the cornstarch slurry into the remaining liquid and bring it back to a boil. 9. Once the sauce has thickened, pour it over the pork balls and cabbage. Next Post Oldies but Goodies! Mmm! Looks good, Cindy! 🙂 I’m a follower now..how did I not sign up to follow before? I simply got to click the follow button on top since I’m with WP, too. yay! Thank you Danielle! You know the sad thing is I have not blogged for a long time (Since August 2012), we had a flood that was caused by the fridge, and even though I’ve been cooking contineously, but my will to blog never came back. Now a days I just post on FB, which has been a lot of fun due to fabulous friends like y’all! To tell you the truth Danielle, Samsung claimed responsibility for the flood, so we had the opportunity to work with our insurance company and redo most of the house. It was months of living in the ruins, but ultimately our 11 old home looks brand new now, so no complains!